A Red Barn and Red Wine in Pittstown, New Jersey ~ The History Girl! Farming is a deep-rooted tradition in New Jersey. Known today as "The Garden State," New Jersey has over 715,000 acres of farmland. We can take pride in the fact that we rank fifth in blueberry production, third in cranberry, spinach, and bell peppers, and fourth in peach production. Farmland preservation has been a top priority for local and state officials for a number of years now. Protecting our agricultural and rural culture is not an easy task. Suburban sprawl and increased development has put many acres of farmland in jeopardy due to the monetary prospects reaped from this prime real estate. Farmland Preservation programs enacted by the State of New Jersey have helped save these farms from future development while providing farmers a chance to continue farming and allowing fresh produce to fill local farmers markets and grocery stores. But it's more than just about the land; it's about the rich, long-standing agricultural tradition - the farmhouses, barns, silos, outbuildings - and what they represent to a people when you think of "rural New Jersey." The restored 1811 barn at Mount Salem Vineyards. In the Pittstown section of Alexandria Township is one farm that has been continuously cultivated for over 200 years. The farm produced various crops including corn, soybeans, hay, and peaches throughout its history. The Abbott Taylor Farmstead, now home to Mount Salem Vineyards, has evolved to reflect a relatively new trend in agriculture in New Jersey by growing grapes. The farmland was originally purchased in 1811 by then 15-year old Abbott Taylor who built a farmhouse and a barn. Spending an evening in the 1811 homestead is like stepping back in time. Meticulously restored with modern touches, it evokes a sense of a true "home" that welcomes all visitors, much like the taverns of the eighteenth and nineteenth centuries. The proprietor, Peter, welcomes visitors for wine-tastings, cooking classes, and other special events throughout the year. During my visit the weekend after Thanksgiving, there was a cooking class enjoying their creations from earlier in the day, a private group sipping wine in a front parlor, while local residents dropped in for a drink in the spacious but intimate living room/double-parlor. The 1811 Farmhouse. Photo by M. Smith. As visitors came in and engaged in conversations, it was if every separate group became one. By the end of the night, all the guests were mingling with one another. There was even a common interest in history and historic buildings. Talk of historic preservation occurred, along with the topic of various wines, and other wineries in New Jersey. All of the grapes grown for this particular winery are from New Jersey, a number of which are grown directly on the farm. The cozy armchairs and couches encouraged visitors to stay awhile and relax as they sampled various wines. The aroma of food cooking on the stove wafted throughout the home. The low-level music and ambient light added to the beautiful atmosphere of this historic home. 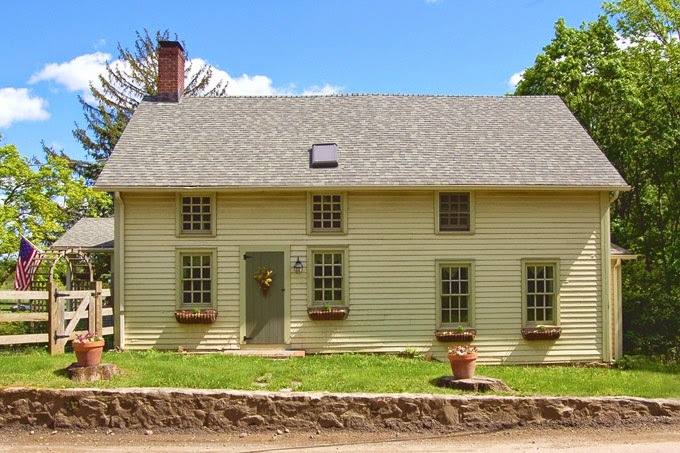 The one-and-a-half story Abbott Taylor farmhouse is built in the federal style and called an “eyebrow colonial.” The left side portion of the home dates to 1811, while the right side was added circa 1836. There is some evidence indicating that the right side of the home was originally located across the street rather than being constructed in-place. An addition to the rear of the house was put on in 1960. A full restoration of the home began in 2000 by the current owners. The 1811 barn prior to restoration. Photo courtesy of Mount Salem Vineyards. The restored 1811 barn was unfortunately not open during my visit due to the wine-making in progress, but Peter was kind enough to discuss his work on restoring it. In 2010, the two-story wooden frame barn, which was originally located at the corner of Mount Salem Road and Whitehall Road, was nearing the end of its life. If actions to stabilize it were taken, it may have not lasted another harsh winter. It had seen its fair share of cars hitting it due to its proximity to the corner, not to mention about 200 years of weather. Asked why he did not just tear it down and build a new building, Peter said that he did look into constructing a pole barn, which is commonly found in the area due to its ease of construction and maintenance. However, in order to make a pole barn climate-controlled for wine-making is a considerable expense. After reviewing the costs and weighing the pros and cons of each, it was decided that relocating the barn closer to the farmhouse and retrofitting it for today's needs was just as sensible and would retain the character of this historic farmstead. A local contractor was hired to move the barn approximately 150 feet from its original location on August 7, 2010. Two months were spent prepping it for the move, which included removing a lean-to attached to the right side elevation which was beyond repair. The move itself took twenty minutes, but the task of fully restoring it was not completed until January 2011. Extreme care was taken to reuse as much of the original materials as possible. Approximately 95% of the barn is original and all replacement wood, joints, and nails were replaced in-kind using traditional methods. The barn structure is fitted with a climate-control system, electricity, and insulation, although to the unsuspecting visitor, they would never know it. The contractor, Herman S. Grefe & Son, carefully dismantled and pieced the structure together on its new slab foundation, ensuring that it would last another 200 years. Moving the barn in 2010. Photo courtesy of Mount Salem Vineyards. The barn restoration was awarded the Donald B. Jones Award for Historic Preservation by the Hunterdon County Planning Board in 2011. Today, visitors to Mount Salem Vineyards can sip fine local wines in either the historic barn or farmhouse, depending on the season, while enjoying the company of good friends and conversation. And much like a historic tavern, you never know who you may encounter or what gossip may be heard around the table. Before (left) and after (right) photos of the first floor of the 1811 barn. Photo courtesy of Mount Salem Vineyards. Before (left) and after (right) photos of the 1811 barn loft. Photo courtesy of Mount Salem Vineyards.